It’s been a wild year. 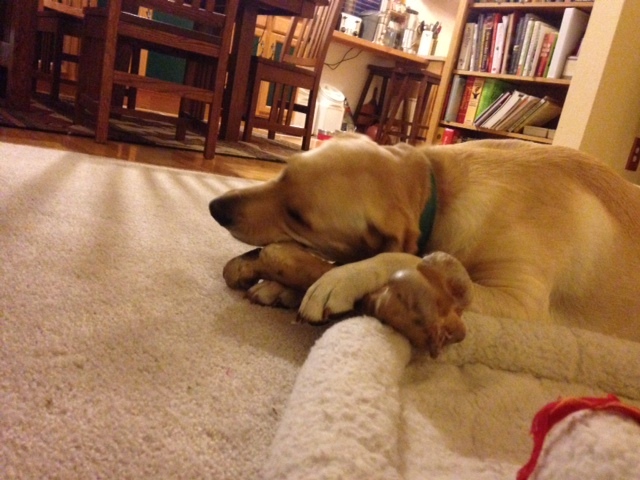 I apologize for going so long without updating the blog but it has been a tough summer. I’ve been going through, lets just say, an illness, and I haven’t felt much like blogging. We managed to bring the garden in and the food processed and the pigs processed, but between that and the hell that I call work, I have been somewhat reclusive. 2017 looks like it has the potential to destabilize our world in a way that we thought was behind us and that we were better than. I’m having to kind of start all over mentally and physically. While some folks don’t always show scars and can put on a happy and professional face, it doesn’t mean the problems aren’ t there. Let’s just say that 2017 will bring many changes. But in the meantime, lets show you what has been going on. We were plagued by grasshoppers this year. They really made the plants have to work hard to grow. Some did well, some didn’t. We lost most of our hard bean crop, the potatoes produced but were very small and many of the herbs were feasted upon. 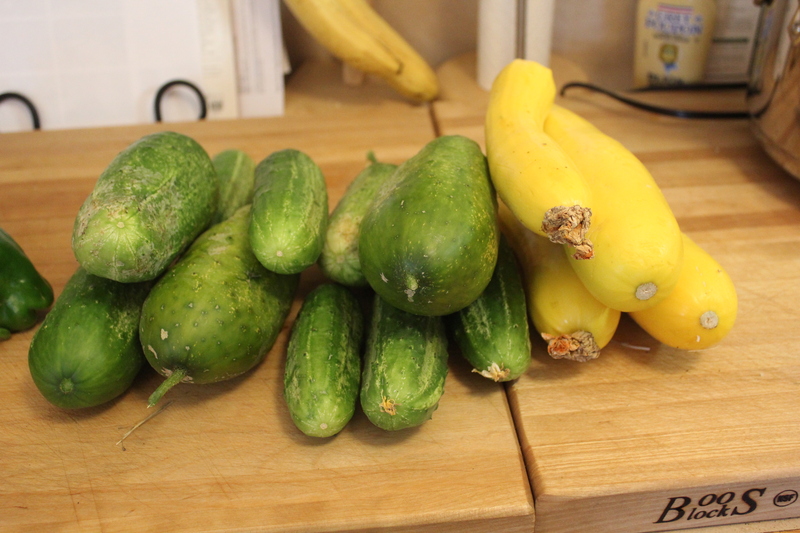 The Squash and the melons got attacked as well but they did quite well anyway. The onions, beets, carrots, peppers, green beans, tomatoes, tomatillos and the Blackberries did pretty well and the canners ran for days and days as we worked to get things preserved. The Tomatillos lost their minds. They really like to grow here. So we made Tortilla soup. The potatoes struggled because of the grasshoppers. 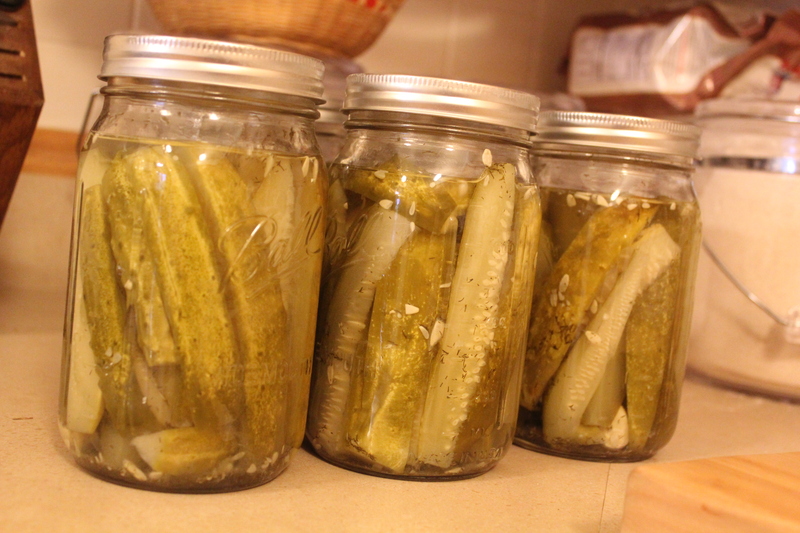 They weren’t a good enough quality to store in the cellar so we canned as many of them as we could. 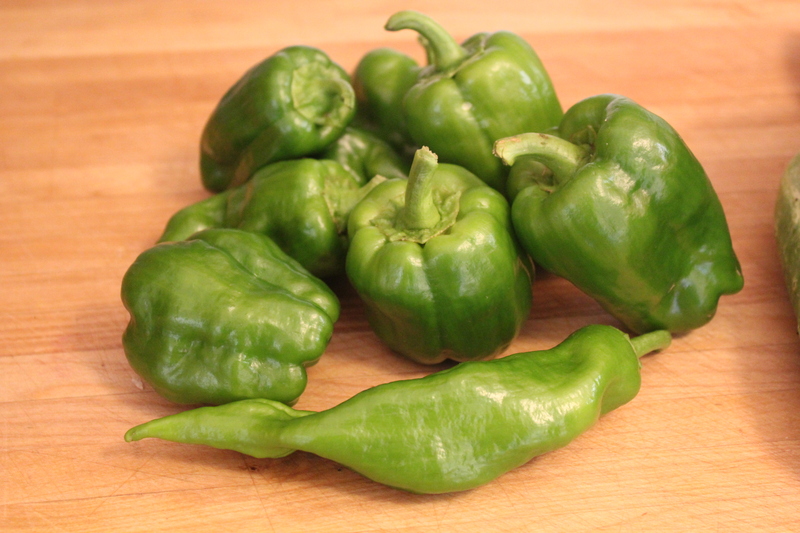 They work great as pan fried, mashed, and in soups or stews. 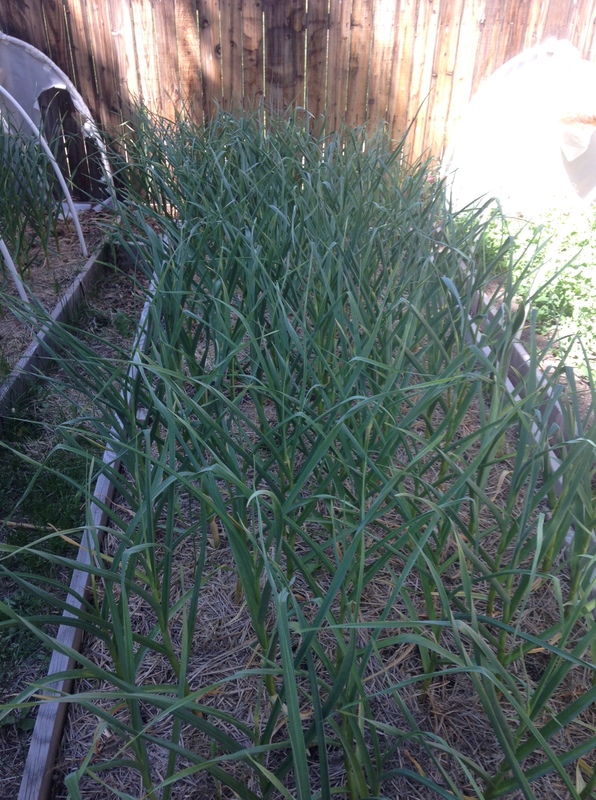 We found some strains of onions that do well here (and love Chicken Manure fertilizer). We found some mesh bags and we tied them up and hanged them in the basement. These should keep for several months. Considering how many recipes use onions we will likely go through them with no trouble. I have really burned out mentally. I brought on a partner at work to help relieve some of the strain. After training him and introducing him to my clients I am thrilled to know that I will be able to take the entire planting season and summer off from work. I haven’t had a real vacation in 30 years and if my clients want me to stick around, they’d best understand why I’m doing this. I love em all but I refuse to die because of someone else’s financial whoas. I desperately need to “Live Like a Hobbit” for a few months. Either that or I need to quit altogether. At this point, both are on the table. We contacted the Dumb Friends League this year and picked up a couple of “working cats” or what ranchers and farmers call Barn Cats. Their job is to hunt and eat mice. We think they are doing their jobs. They are quite feral so they are not looking for human companionship. This is allegedly where they sleep. We know they are around because the food and water disappears. But this picture shows how much we know about them and what they look like. One of the funniest things that happened this fall was washing a chicken in the kitchen! Yes you read that right. We had taken the pigs to freezer camp the week before. However, their wallow was still sloppy and muddy. The chickens love to go into the pig pen and scratch around and eat any remnants of food left behind. One evening Zina was out rounding the hens up to put them to bed and she noticed one was still in the pig pen. When she got closer she saw that it had gotten into the wallow and was stuck up to her wings in mud. The rescue attempt involved putting a plank out onto the mud, pull the chicken out and bring her into the house to rinse her off. She was amazingly docile and is now doing well, but now we can honestly say we gave a chicken a bath in our kitchen. I feel so fulfilled! We have commenced work decommissioning the gardens in the city. We have decided to sell that house because the equity in the place will pay off the farm. Zina and Aaron will maintain an apartment instead and I will pretty much live full time at the farm. I lugged the boards we used for the raised beds to construct compost bins for the garden waste and chicken litter. This past year we spread the composted chicken litter on the garden beds. While it was terrific as fertilizer it was also full of herbicide resistant Amaranth seeds that sprouted the second we applied water to the beds. This is an attempt to try to keep those down. There were thousands of those infernal plants. Our newest members of the flock started producing in October and even with the shortening of the days into the winter we have never had a shortage of breakfast food. I never thought I’d see the day when our country could become so divided. This was the unfortunate discovery of the fall. We have a militia training facility about 7 miles from the farm. These folks are pretty “out there” and I hope they have sense enough to leave well enough alone. That mound of dirt running along the upper third of the picture is actually a big horseshoe shape containing a very large shooting range. I fear our country has lost it’s mind and could be considered clinically insane. So as the farm progresses we have decided to start breeding pigs ourselves instead of buying piglets to raise. We have some fences and pens to complete but if all goes right we will have a Hampshire Sow and Boar to raise in the next year. If successful, the sale of the piglets we don’t want to keep should pay for the feed and thus allow us to have our meat for free (minus the physical exertion of raising them and processing them). A lot of folks do that out here and between eggs, chicken, and pork, we see a way to completely offset our grocery bill. That would make us, food bill, electric bill, water bill, house payment and car payment free. Someone in this household is one hell of a financial planner! I thought this shirt was cool so I ordered it! The puppies had a ball this Christmas. They could smell that there were treats amongst the gifts and when Christmas morning arrived they couldn’t wait to join in! So there you have it y’all! The JAZ Farm has progressed despite our silence. Not only are we looking forward to the growing season in 2017, the new pigs, and ordering our new meat chickens for the year, we will be hatching some of our new layers with our incubator, moving from the city, paying off the farm, taking the summer off, building a livestock barn, fencing in a pasture and perhaps, if the timing works, buying some pet goats to help with the lawn mowing. If there is one thing that can be said for our homesteading/prepping project its this: It Is Always An Adventure! Happy New Year everyone! This post is more of me thinking it out as I type. I believe completely that there are no mistakes and where you are currently is exactly where you should be. Why that is the case isn’t always clear, so sometimes one has to sit down, shut up and simply let it all unfold. Now anyone who knows me knows just how difficult that can be. After all, if something needs fixing (even with my clients) by god it gets fixed! There is none of this waiting around nonsense. There is a problem, it has a solution, get after it! Not so trying to figure out what does and doesn’t work on a farm. We have met with success and failures this year and it is the job of a good homesteader/farmer to learn from both and improve. So indeed, some navel gazing time is in order. Considering that it is cloudy and looks of rain today, what better time to ponder. The successes: We got the place and built the majority of the infrastructure inside a year’s time. The chickens both for eggs and meat have gone without a hitch. The building of windbreaks and irrigation systems have worked pretty well but I need to remember to keep checking the timer systems and the associated screw joints. I have had a couple of leaks but all in all it looks like this system will work out. The observing field is a great place to star gaze and the new deck (that was forced to be replaced because of dry rotted wood) is a fabulous place to sit outside and just look at the expanse of the plains. Our seeding rooms at both places are working great. I am so pleased and thankful to have such a big space to get the plants started in the spring (although some ventilation in the farmhouse basement is in order as all of those plants made it incredibly humid – bad for the telescope). The setbacks: To sound like a politician, “no one could have anticipated” the massive hail beatings we took this year. After the shock, and trying to salvage the garden at the farm, I have been hearing tales of whoa from just about everyone. It did bring some things into focus. Unless it is a storage crop, it simply cannot be planted out here. Kitchen garden vegetables (those with leafy stems and produce fruit) are on a roulette wheel and cannot recover from these peltings in time to be useful. We planned almost exclusively to encounter drought and wind. We got the exact opposite: Hail and thunderstorms. So how do we adapt? This next season the urban farm will be home to all of the kitchen garden plants (tomatoes, peppers, lettuce, spinach, kale, cucumbers, zucchini, broccoli, basil, etc). 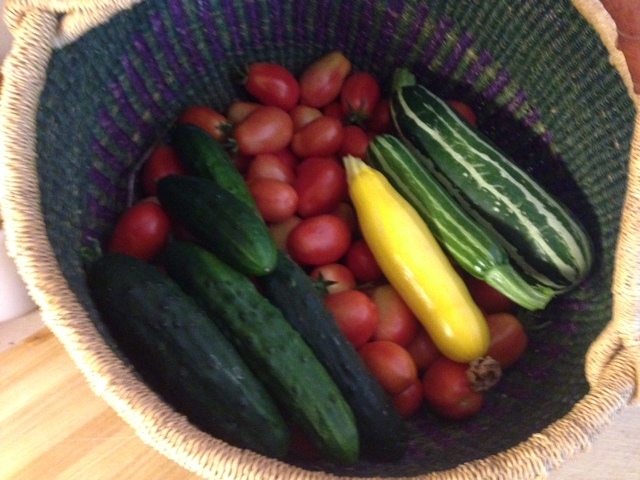 That garden already has hoop covers and it has proven itself to produce huge amounts of vegetables. The only thing that needs to be done to it prior to next season is to trim back the tree. Since we cut down our aspens, the ash tree has gone nuts. It is casting too much shade. So this winter some of it will become firewood. The plan is then, as we replenish our cash reserves, to wait for the greenhouse I have my eye on to go on sale. This will give us a year to get it constructed and not disrupt the growing season. The soil: In the city, I was able to hand tailor the soil in the garden beds by bringing in 50 yards of planters mix to put over the rock hard clay. That soil has been developed over the years to become a black sight to behold. At the farm it is simply too big to do that. It is also mostly sand. In good organic gardening fashion I made all 18 rows, raised beds. 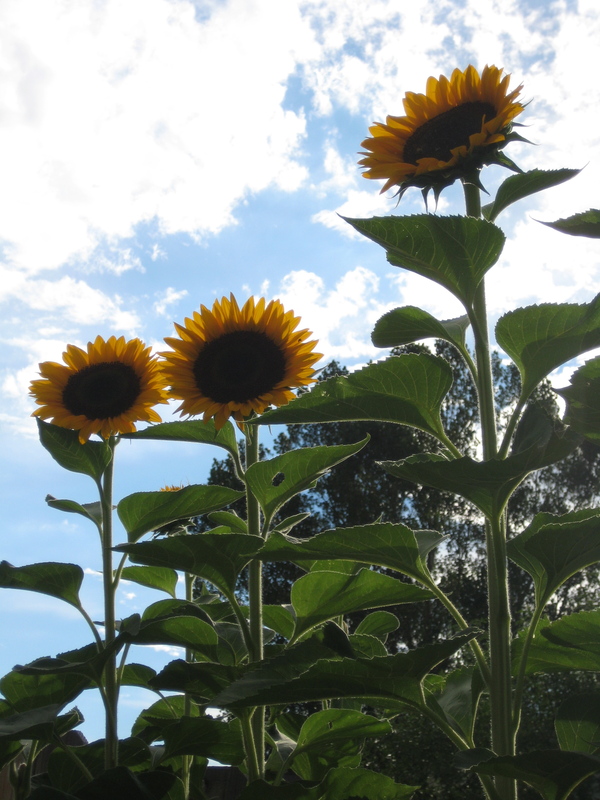 They average about 45 feet long and at the beginning of the season they were about 15 inches high. Ordinarily that would be a good thing; unfortunately with the hail and thunderstorm deluges the erosion was awful. The sandy soil wore away to the tune of more than an inch per storm. So a couple three things need to happen: 1. The beds need to be lower or flat to the ground. 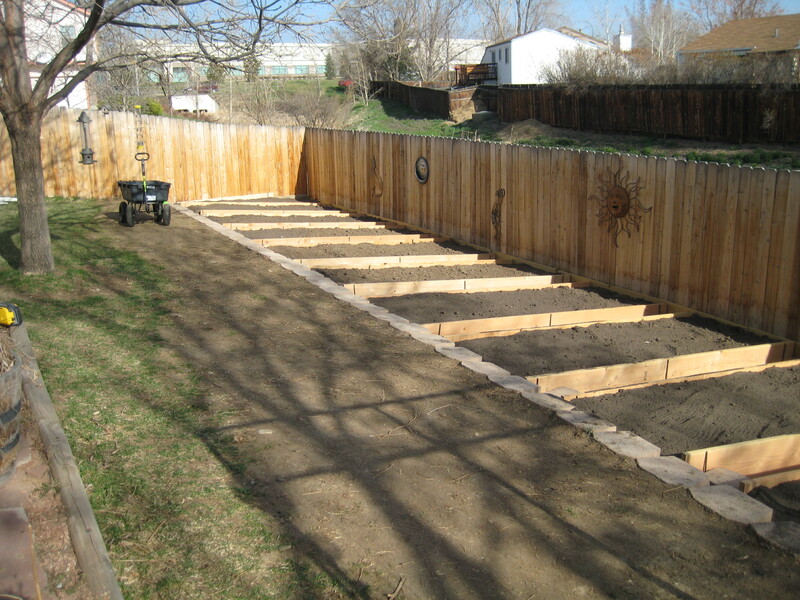 To achieve the same result as a raised bed they will need to be broad forked so the root depth is adequate. A six inch raise is ok but unless I can find free timbers to box in all of those beds they can’t be raised. 2. Huge amounts of compost needs to be worked in. I did some this year and those beds where I did have held up pretty well. Fortunately I have about 50 yards of compost. If that isn’t enough then we will need to check into bringing some in from off property. 3. Each year a section is going to have to be held out of production and have cover crops like alfalfa, clover, buckwheat, beans, etc. to help get more organic matter into the ground. 4. Because it is the winter that is the windiest time of year, to keep all of the above in place, the beds need to be covered and staked. It appears that the rolls of burlap I ordered will come in handy. 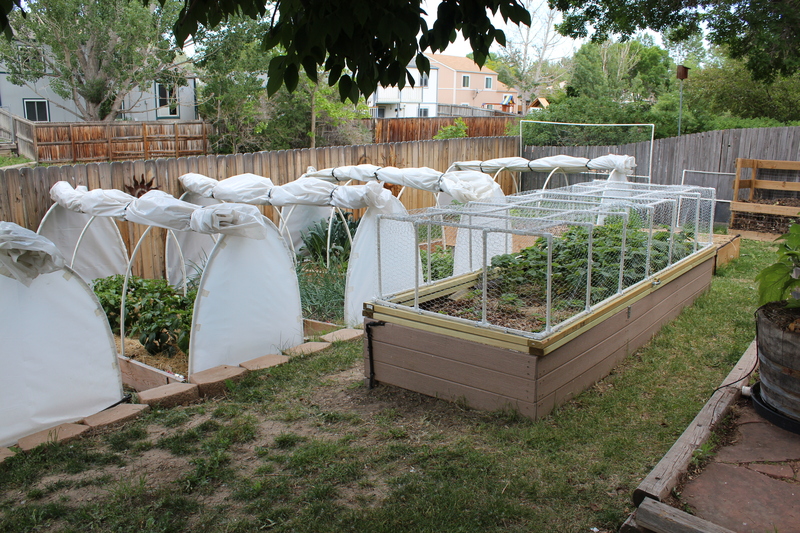 The Plants: I found some neat hoop covers from Grower’s Supply that should work well to keep some of the more sensitive plants covered. Winter squash still has big leaves so they need some protection. The beets and carrots could use some cover as well as the onions when they are young and fragile. 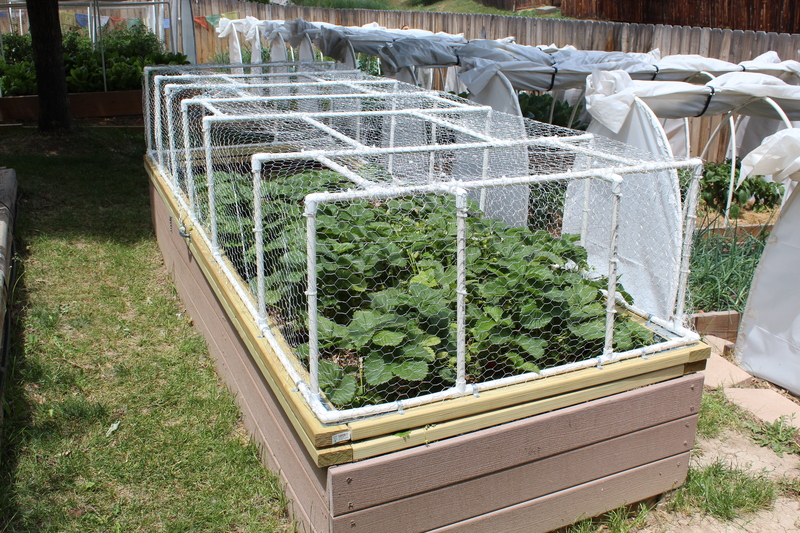 So some of the beds will get hoop covers similar to the one’s in the city (only more stoutly constructed). 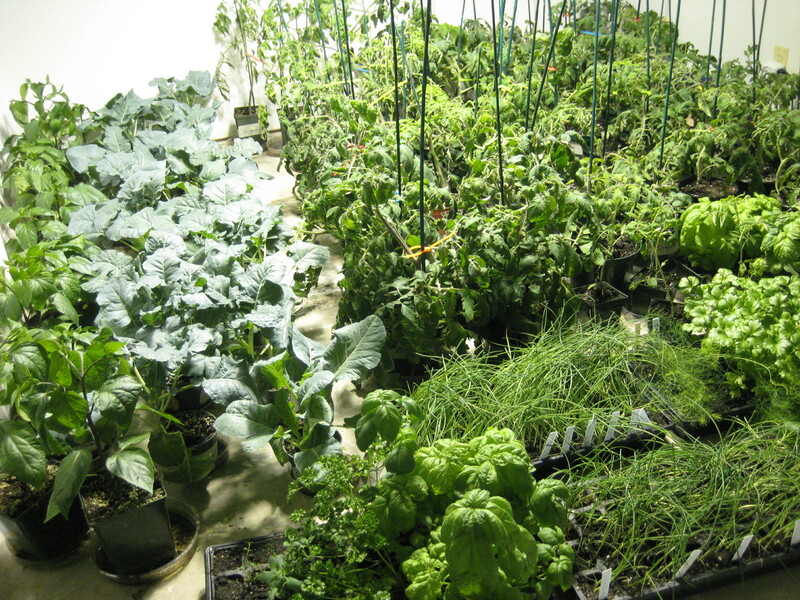 At the farm, anything that has been started indoors shouldn’t be planted outside until the first week of June. Not because of frost but because of the violent weather that accompanies the snow melt in the high country. The urban farm can be planted around the week before Memorial Day as has always been the case. At the same time we will be investigating greenhouse construction that will eventually bring all of the vegetable growing to the farm. The urban farm will likely become a pollinator garden, along with greens and my usual huge garlic crop. The winter project then will be to get the pig pen built and the front 5-7 acres fenced in anticipation of putting up a barn. So the universe didn’t seem to be telling me that we were idiots for starting this venture and that we should get out. It was showing me in pretty “right between the eyes” fashion what works and doesn’t work here. OK OK! I get it. I notice that when I get going on this farm construction kick, that I see it in the fashion of it being an organic farm designed for production of veggies and such to be marketed at places like farmers markets. That simply isn’t true. We may do some of that in retirement, but it was never intended to be that. It is a homestead; a little house on the prairie (literally); and its mission is to try to provide the maximum amount of food this family consumes in a year. While we have had a learning setback this past spring, it is still well on its way to accomplishing that mission. It is the farmer him/herself that needs to maintain the proper perspective. It is now time to grow the place now that it is built. The fun part, it seems, is within grasp. I hope this helps with anyone else looking to do something like this. Sometimes mother nature swings her bat pretty hard. I wish you all the best successes. Keep persevering. What else is there? After having to get a tremendous amount of “real” work and doctors appointments out of the way we are back at the JAZ Farm. When I arrived (we were in the city for 2.5 days) we discovered that the automatic door to the layer coop hadn’t opened. Evidently the battery was dead. The birds had been sequestered in the coop and were more than happy to come out and partake of the scratch grains we provided them. Now before anyone freaks, they have water in the coop so they were just a tad hungry. Aaron and I will be off to the Home Depot tomorrow to acquire some lantern batteries that the door requires. So it was pretty smart of us to make sure the city garden got planted out. It is doing incredibly well as usual. We have harvested 2 bushels of spinach, a bushel of Kale (that we use for juicing), and the garlic is on its way to being a bumper crop that I can use to both eat and plant for next year’s supply. Everything is doing very well. 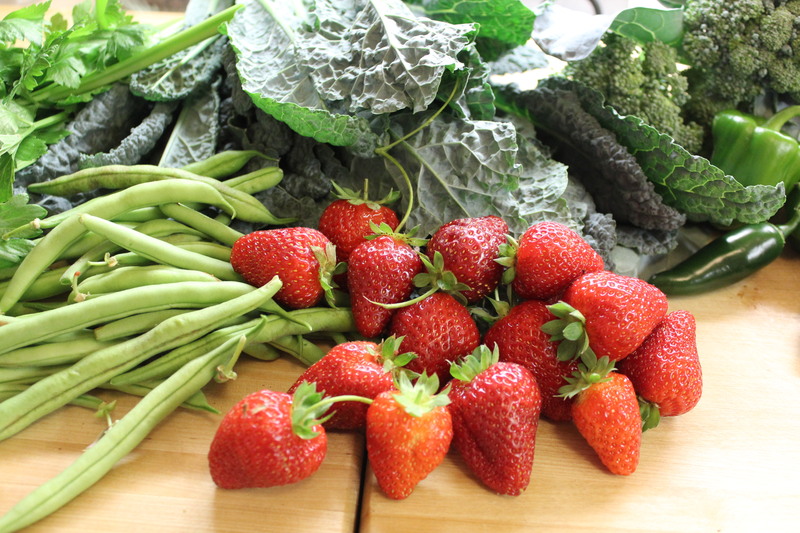 We are awaiting the small window when the peas will be ready and the strawberries, so far, are our best crop yet. 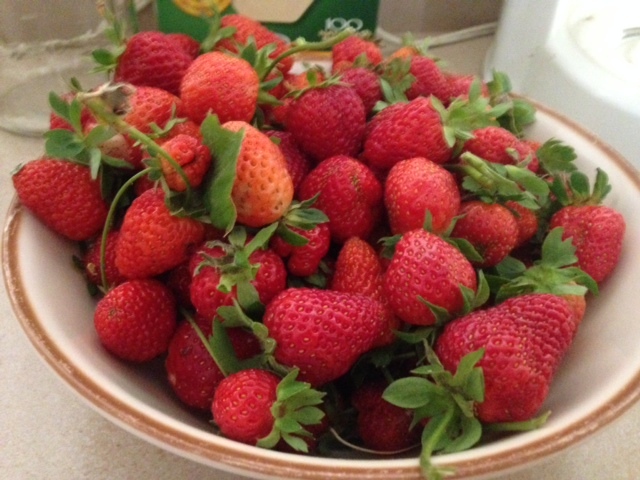 So the smarts comes from knowing that the country farm garden might be met with some unknowns…. what a understatement. HOWEVER: Quit whining Farmer Jon!! 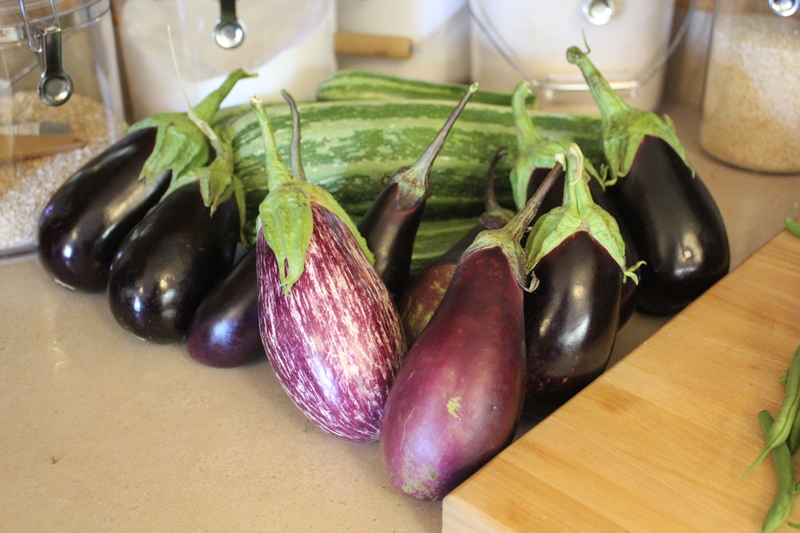 Sure we have to write off the eggplants and most of the tomatoes at the JAZ Farm because of the hail, but everything else is doing great!! We are going to build a greenhouse this fall which will cover all of those more sensitive plants; it is an unexpected evolution but it will solve the hail problem. The root vegetables and the beans and all of the corn, onions, asparagus, beets and carrots are on their way to being very successful. Perspective is everything. When you are sitting in your home listening to the gates of hell unleash upon your property during a hail storm, one thinks all is lost. The truth is that mother nature is resilient. We are going to have quite a harvest should this growth continue. 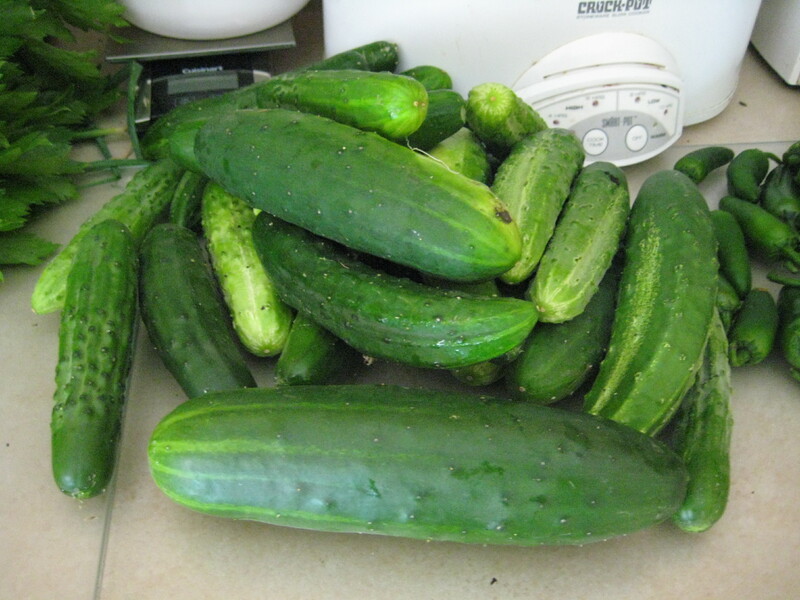 So between the city garden that has been used as a back up and the experiment of the JAZ Farm, we will have a great deal of food to put by for the coming winter. When we get the greenhouse put up, all the more. I had my engineer wannabe, Aaron, figure out how to lay out a rectangle on the ground to put in a fence to house the pigs we will be getting next fall. Tomorrow we will be getting batteries for the chickens, fence and fence posts for the pig pen and yet another project will have begun. The only deterrent right now is the plague of mosquitoes that have hatched from all of the standing water left over from the storms. The outdoor clothes will be quite thoroughly doused in bug juice so we can continue the farm development during the non-snowy month! Our wheat field, evidently has been considered a loss. The farmer we leased the land to is going to have someone come out and cut it down and bale it. I am not too upset as I will be receiving about 100 straw bales that can be used to bed the chickens and mulch the garden beds. On top of that, as it has been declared a loss, I may head out with my weed whip and knock a bunch of it down and try to salvage some wheat. We will have hard corn for corn meal this year and will need a grinder. Might as well gather as much wheat as we can since it isn’t going to be sold, and save it to make our own bread. Farm Jon….. da man got smarts, skeels, and should just quit the freakin’ whining over the hail that didn’t get everything. I love the JAZ Farms! Ordered the drip tape system for the farm. It will handle up to 40, 100′ rows on one flow zone. The garden will use up every one of them. Also mapped out the urban garden today and used my Mother Earth News garden software to get the calendar set for planting dates. Seedling starts begin next week and will continue through March. 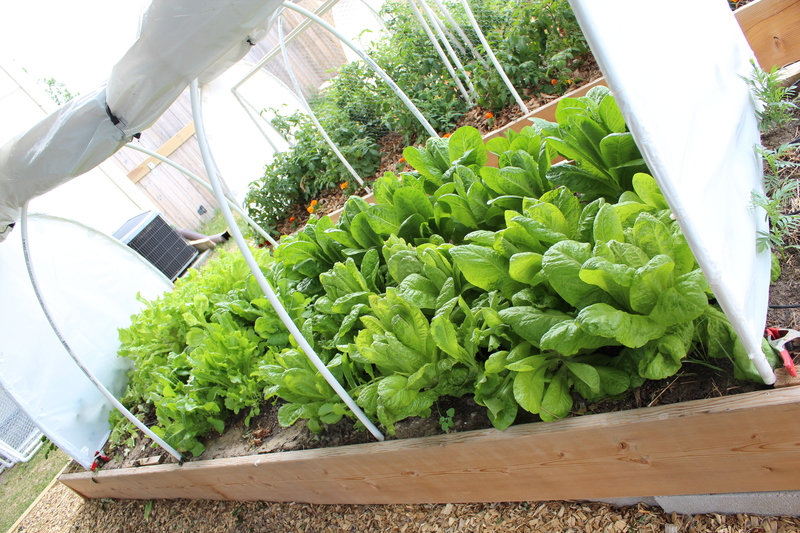 The urban farm hoop huts will get the cool season veggies going faster than normal (Cauliflower, Broccoli, Spinach, Peas, and Lettuce). The direct sowed seeds will happen Mid-May through the first week of June. Cover crops this year for soil improvement will be Crimson Clover, Dry Beans, Bush Beans, Alfalfa, Amaranth, and Millet. As usual the grow room/seed starter room is going to be pretty full. Along with the new greenhouse tables at the farm. Several thousand plants by the looks of things. Time to order the black plastic mulch…. We have been very focused on getting the chicken coop finished and making sure that all is well with the birds, the farmhouse, dog, and a kid going off to college. We haven’t posted much about why the farm even exists! FOOD! Despite the blistering schedule of trying to balance two jobs, a high school graduation, kid off to college and a farm, we managed with the help of grandma to get the urban farm planted this year too! It has kind of been left to its own devices though. The birds took the onions and a squirrel took a bunch of the corn (my squirrel repeller being at the farm and not in the city). In a moister part of the yard we had some slugs in the tomatoes. BUT! 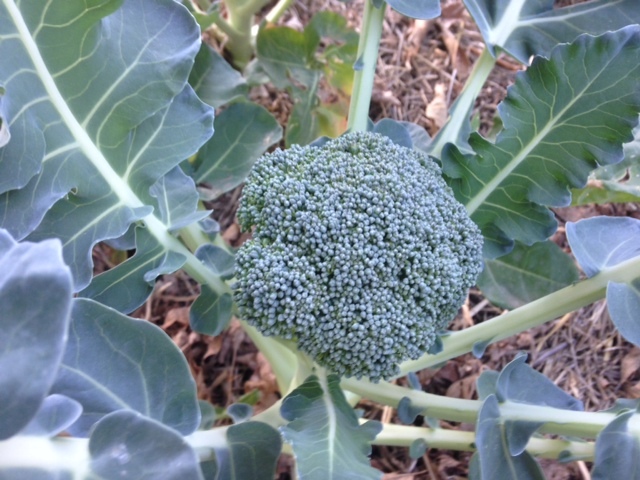 We have had a great harvest of broccoli all summer, we have had strawberries, kale, herbs, lettuce, cucumbers, green onions, a year’s worth of garlic, beans, some corn, and a bunch of peppers. Not bad! 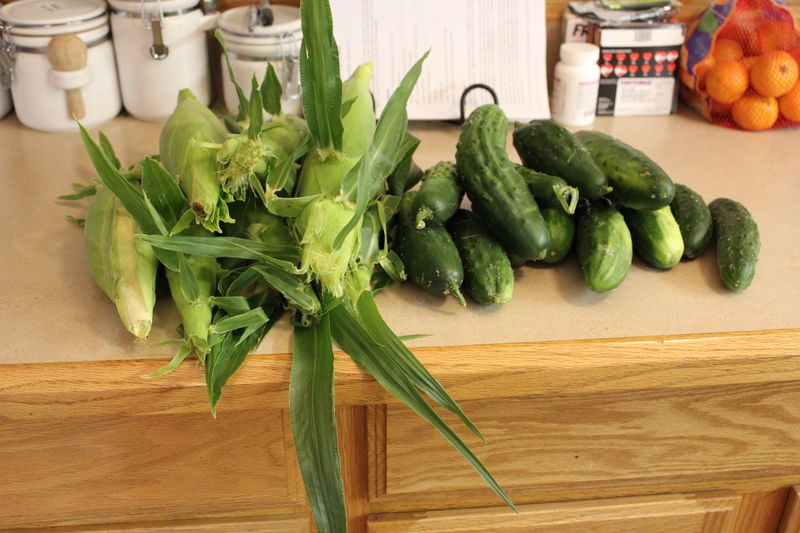 Today, I got up early to beat the heat here and went out and picked stuff. 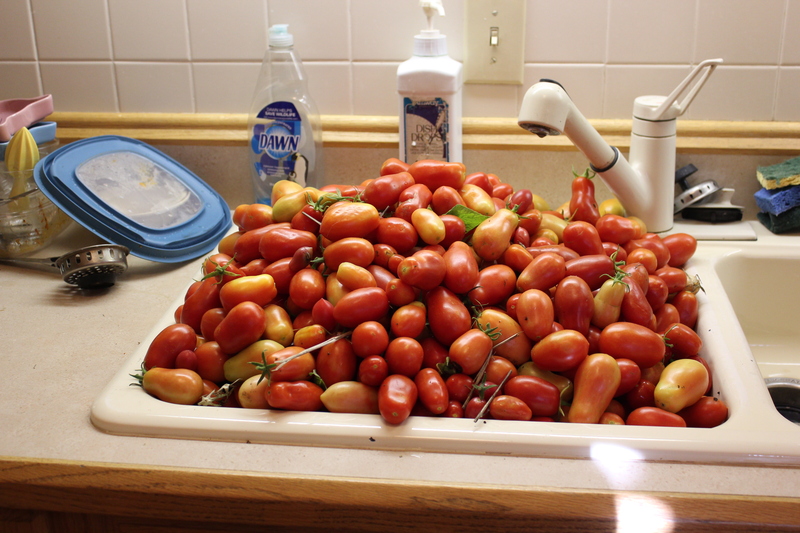 I got through most of it but I got stopped in my tracks with the tomato harvest. My Roma saucing tomatoes lost their minds. I picked over 100 lbs of tomatoes thus forecasting what the rest of my day was going to be like. I froze 25 lbs of whole tomatoes and as I type, have 3 stock pots of tomatoes boiling down to sauce consistency on the stove. This one day will provide us with all of the tomatoes we will need until fall 2014! Due to time constraints I am freezing it all instead of canning. 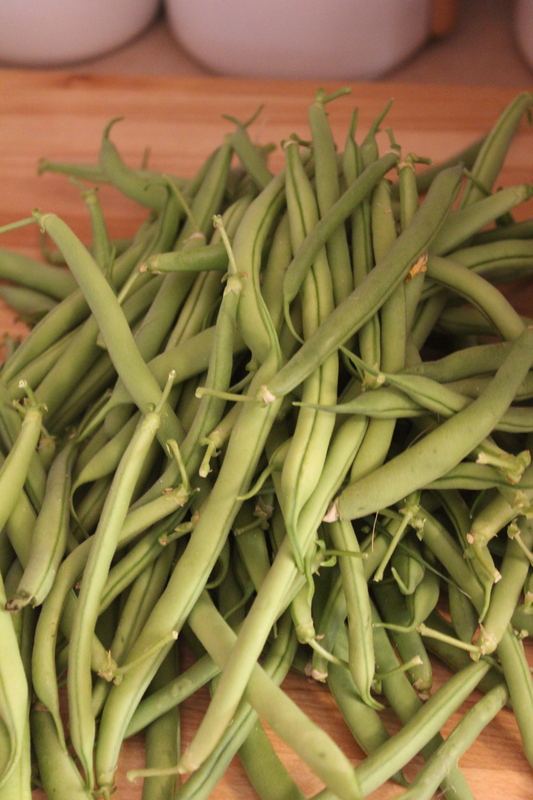 When the beans come in they will need to be canned as we have found no good way to freeze beans that doesn’t make them taste like bicycle inner-tubes. 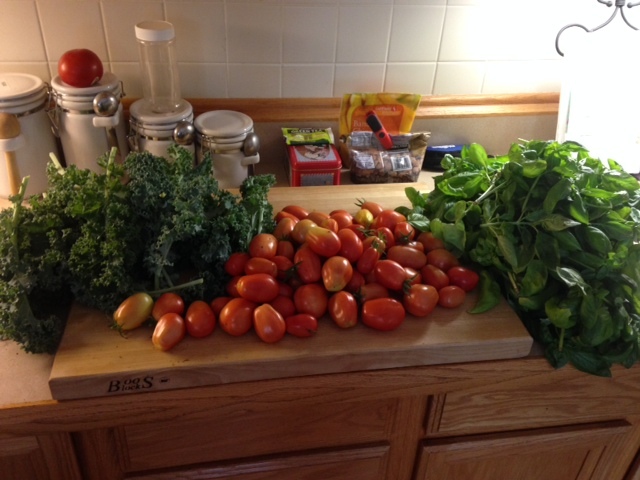 This evening I am going back out to pick Basil (not the dog), Kale, green onions, and peppers. I will be able to make and freeze all of the Pesto we need for a year. Corn, cherry tomatoes, cucumber salad and Italian sausage for dinner! Yum! Total distance to plate …. 40 feet. Chemicals used….. ZERO. Happy Labor Day all! Given that labor is now treated like an evil step-child, we need to remember the people who really built this place. Working and laboring to build a farm and all of the construction work it has taken, they have my undying respect. The JAZ Farm homestead isn’t our first trip to the homesteading trough. Coming from a family that was gardening before Urban Farming was even a term, and having roots in the world of Iowa cornfields back when farms were still farms, not the mono-culture, CAFO, ethanol producing factories they are now, it was inevitable that this kind of life blossom. One of my very best friends, who I hadn’t spoken with in a decade, mentioned when we got caught up, “you know this isn’t too much of a surprise, if I remember right your mother had something of an organic operation going in her backyard while we were growing up”. I was surprised that he remembered that but yes its true. Other than her teaching music lessons, one of my vivid memories of my mother was seeing her bent over in her garden. Zina’s father was an Italian farmer in Sicily and he too has always had a garden in his backyard. In fact, one of his first jobs in America was working for a grocer. So with that background, and as I (Jon) learned more about Peak issues, the disastrous state of our food supply, and the deteriorating water conditions in Colorado because of climate change, we began the transformation to a more sustainable way of life. When we bought our suburban home, it had the world’s ugliest front yard. It was poorly cared for and pavement quality clay made up most of the available yard. 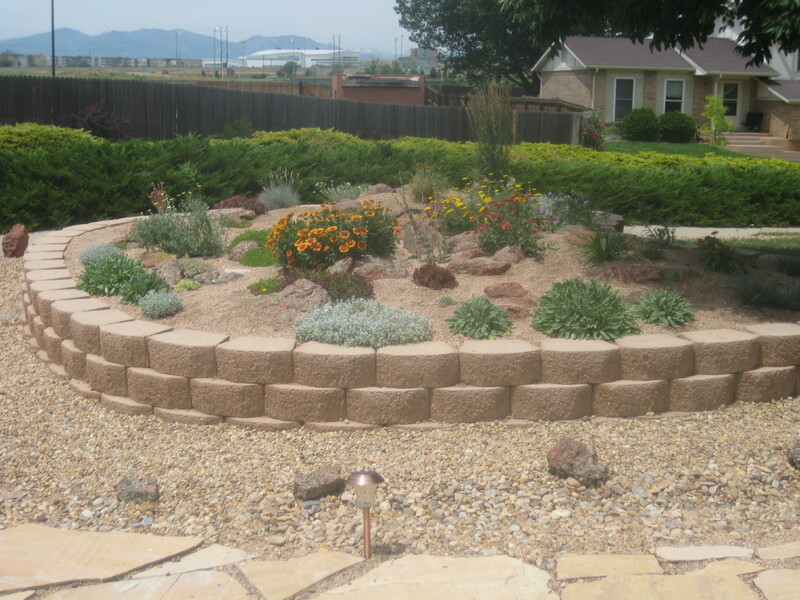 We didn’t want to add anything like traditional Kentucky Bluegrass seed (grass in an arid climate is the height of stupidity) so we delved into the world of Xeric landscaping. 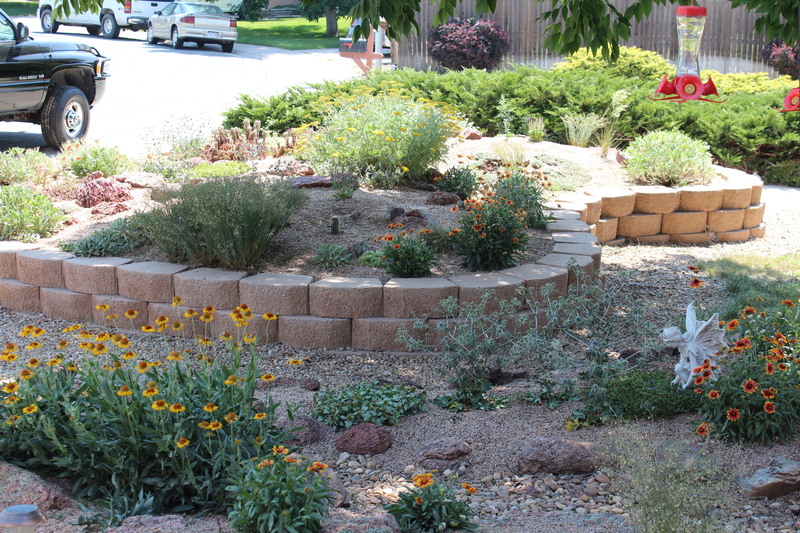 The front yard was transformed into paths of flagstone, granite lined water efficient plant beds, Russian Sage, and a growing bed made of landscaping stones. 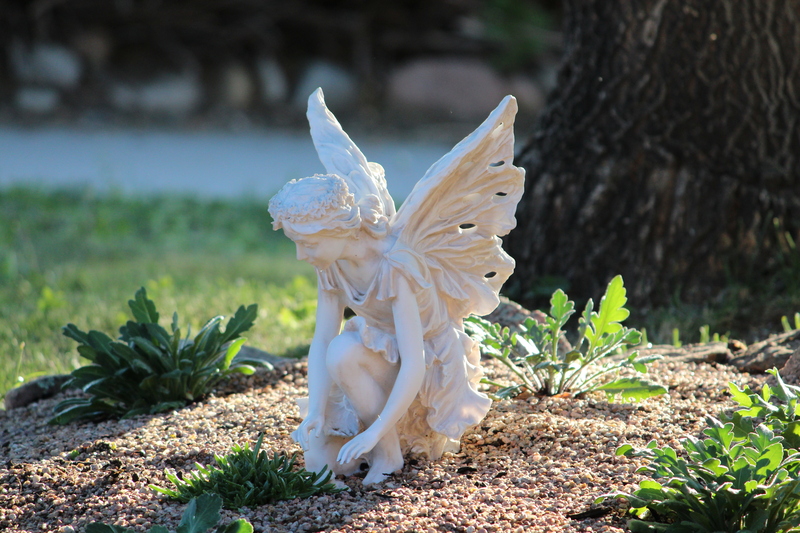 We hauled in thousands of pounds of stone, gravel, rocks, topsoil, and plants we had never used before…. we jumped in head first. This has been Zina’s playground for several years and she has become the resident expert on Xeric growing. 1. 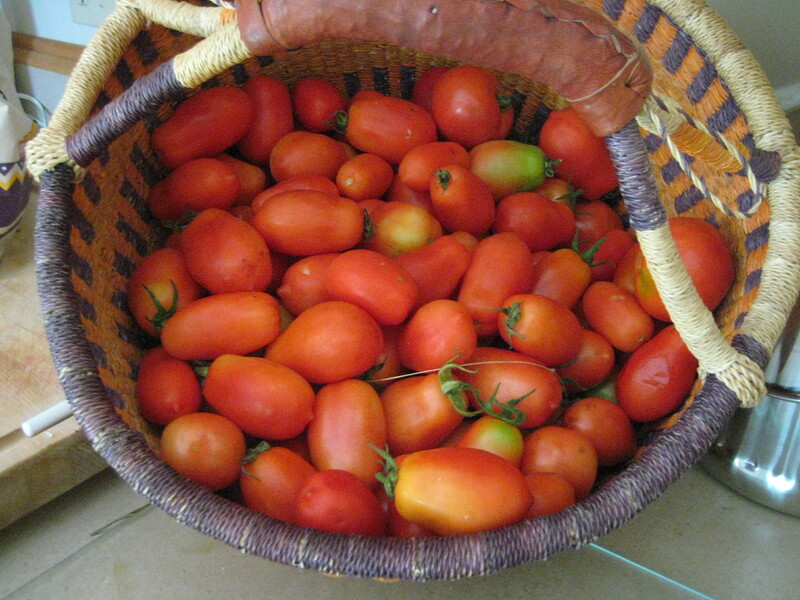 It is very limited quarters and the tomatoes, as you can see, get HUGE! 2. If you get insects it can be very difficult to get rid of them. We had a serious issue with Whiteflies. 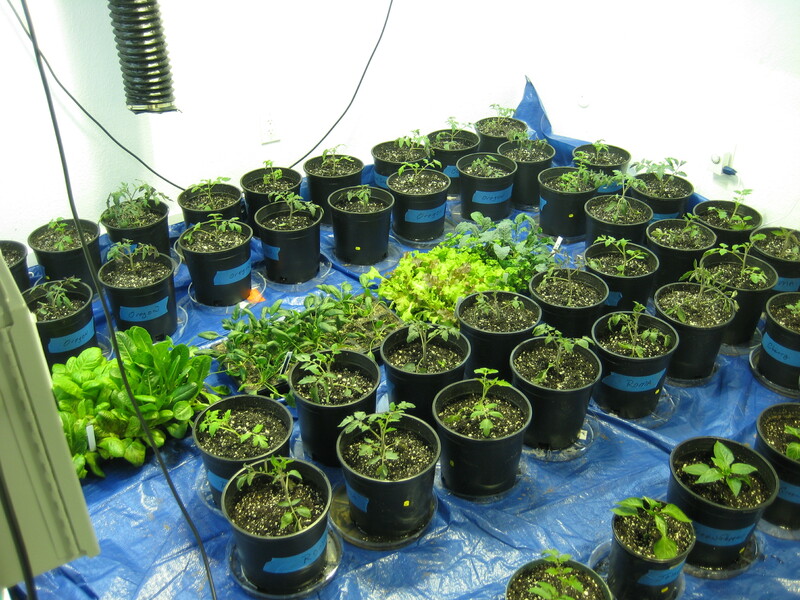 While they stayed confined to the grow room they were an infuriating nuisance. 3. As it requires supplemental lighting, it is NOT energy efficient. I have 3000 watts of lights on timers. The big Halide lamps use enormous amounts of electricity. To get around the energy issue and in keeping with a desire to be more sustainable we contracted with Solar City to put solar panels on the house. As we didn’t have room in the backyard for a greenhouse of sufficient size, this was a way to take the sun, turn it into electricity and use it to power the grow lamps. To date we have had almost no electric bill. 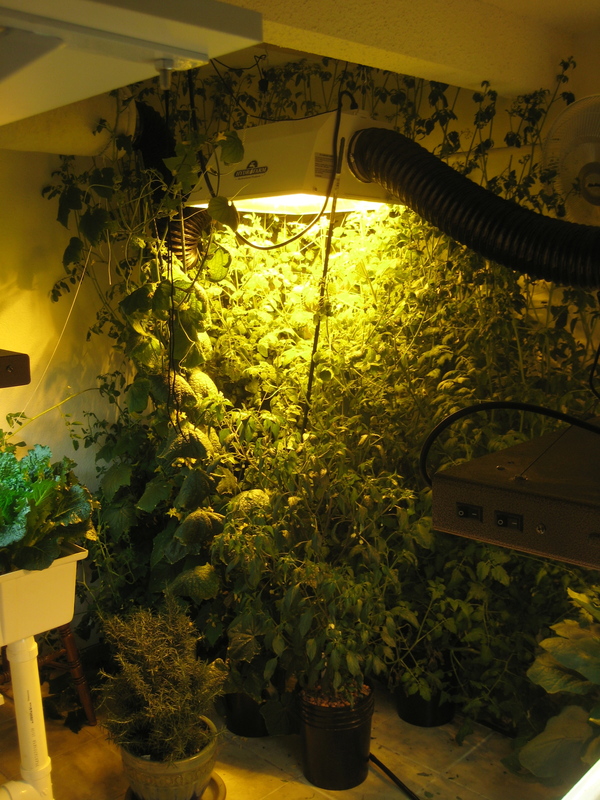 In the late winter, the hydroponic system would get shut down and converted into a room to start seedlings for the urban farm. 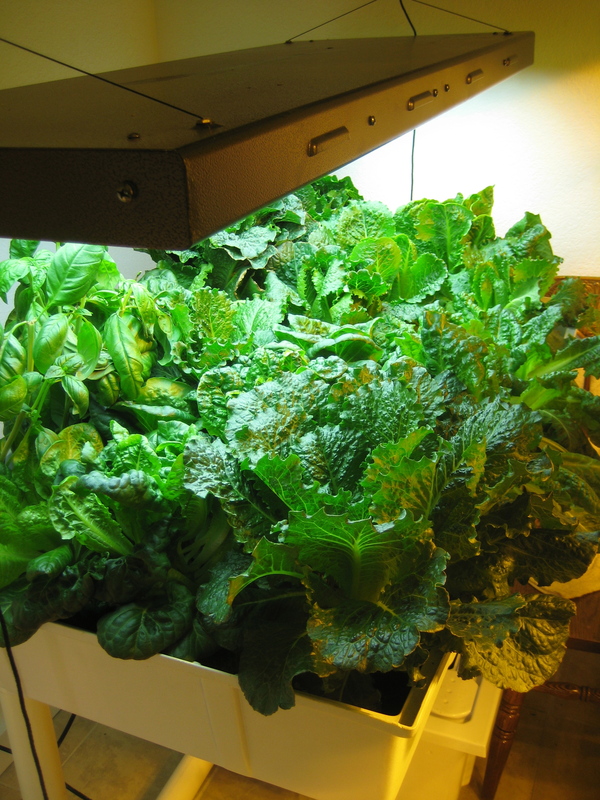 After getting a taste of the produce just from a small hydroponic operation, I had a burning desire to have it on a grander scale. 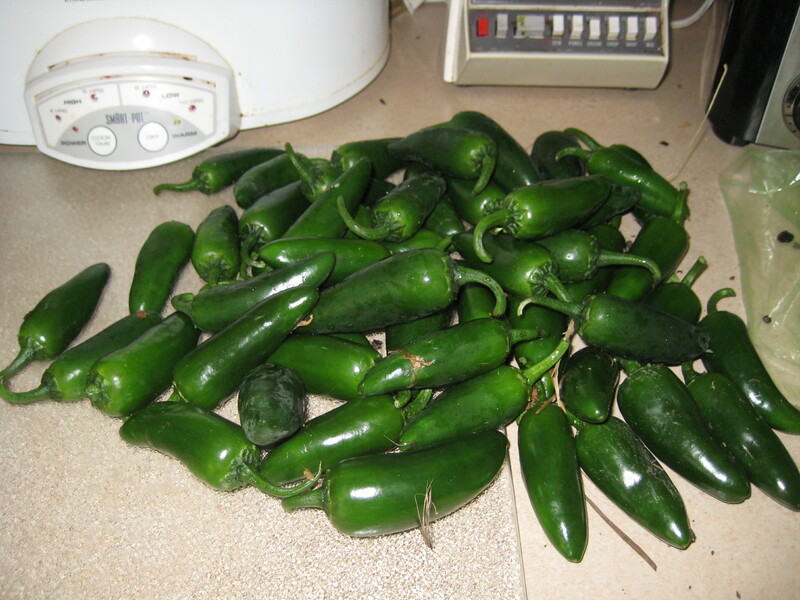 We wanted to see just how much our yard could produce. The back yard had no access to vehicles so everything needed to be brought in and built by hand. 30 yards of topsoil and all of the materials for the hoop covers were all brought in by wagon. My pick-up got quite a workout … and so did I. The JAZ Farm homestead evolved out of all of this. Evidently we have the gardening and sustainability bug. It is all wonderful therapy – Especially in a country that seems to think that food comes from a drive through or is wrapped in cellophane.